For more than 30 years, Arthur Maslow has been a leader and an innovator at the Ackerman Institute for the Family. He began as a student, eventually joining the Institute as Director of Administrative Services and a member of the faculty. Working with faculty member Howard Weiss, Mr. Maslow created the Family School Collaboration Project in 1980. It was Mr. Maslow’s vision that created and funded the Diversity in Social Work Program in 1992. 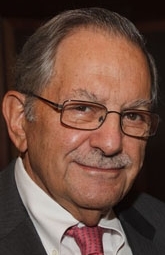 Mr. Maslow serves on the Institute’s Board of Directors and was Chair from 1999 to 2003.